Pamela Joyner (left), Dave Chappelle (center), and Colin Kaepernick (right), all recipients of the award, listen to a speech during the medal ceremony. Harvard’s thousand-seat Sanders Theatre was packed to the gills for the annual presentation of the W.E.B. Du Bois Medal at the Hutchins Center Honors, a celebration of achievement, diversity, and activism. A grand total of 17 separate standing ovations greeted the stars present at the ceremony. 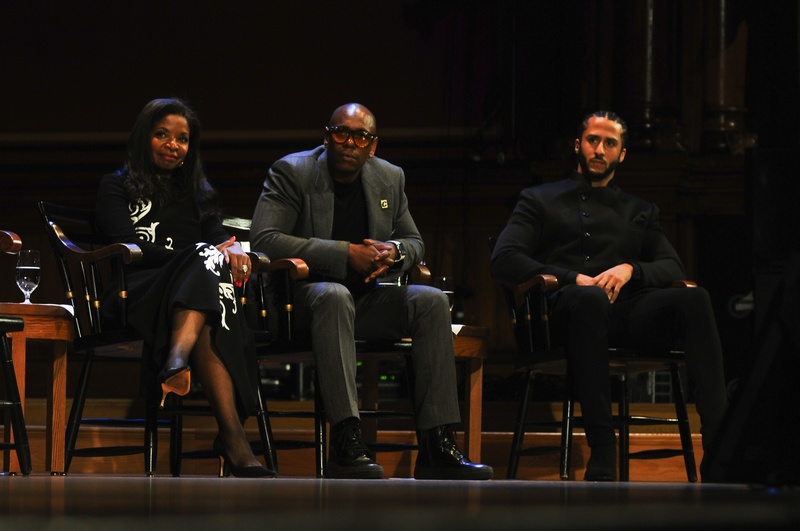 Speakers ranging from professors Henry Louis Gates Jr. and Cornel R. West ’73 to athlete-activist Colin Kaepernick, comedian Dave Chappelle, and Kehinde Wiley — an African American portrait artist who painted Barack Obama’s official presidential portrait — all called for increased advocacy for marginalized groups. Other notable attendees included University President Lawrence S. Bacow, students from local high schools, the Harvard Men’s Basketball Team, Muhammad Ali’s family, and Jaylen Brown of the Boston Celtics. Kaepernick, famous for boycotting the national anthem at NFL games to protest police brutaliy — and for quarterbacking the 49ers to the Super Bowl in 2012 — was a much-anticipated speaker. The first standing ovation of the night kicked off as Kaepernick, the initial honoree invited onto the stage, entered the theater. 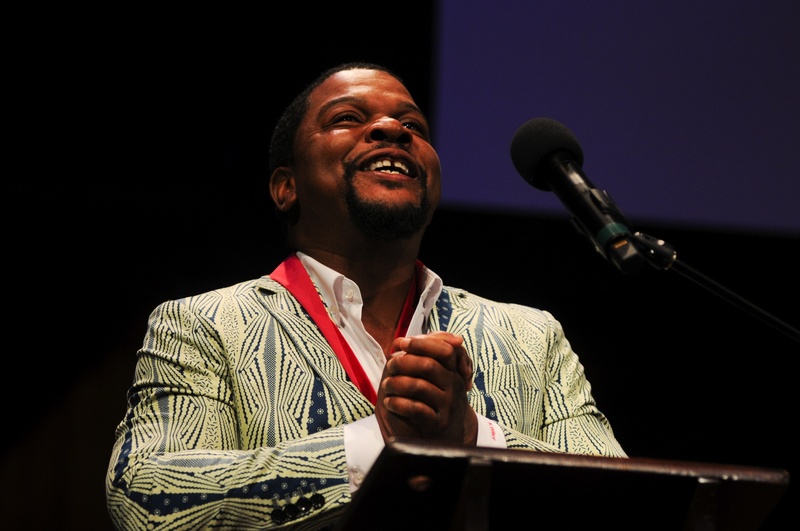 Renowned artist Kehinde Wiley delivers a short speech to accept his medal. Wiley is known for his uniqely-styled works of portrait art, which include the 2018 portrait of Barack Obama. A 10-minute laudatory introduction from West further hyped the crowd for Kaepernick. However, West ensured the awardees remained accessible to the packed audience. “Keep in mind, young folk, these are not glitzy celebrities, they are exemplars of excellence,” West said. Kaepernick, for his part, erred on the side of saying more by stating less. In his softly-delivered acceptance speech, he drew attention to the everyday struggles of people across the country. Kaepernick recalled the story of a visit to a high school football locker room before a big game. Kaepernick’s remarks were prohibited from being videotaped or photographed due to ongoing litigation. Kaepernick is currently suing the NFL for conspiring to keep him off the field after his protests. 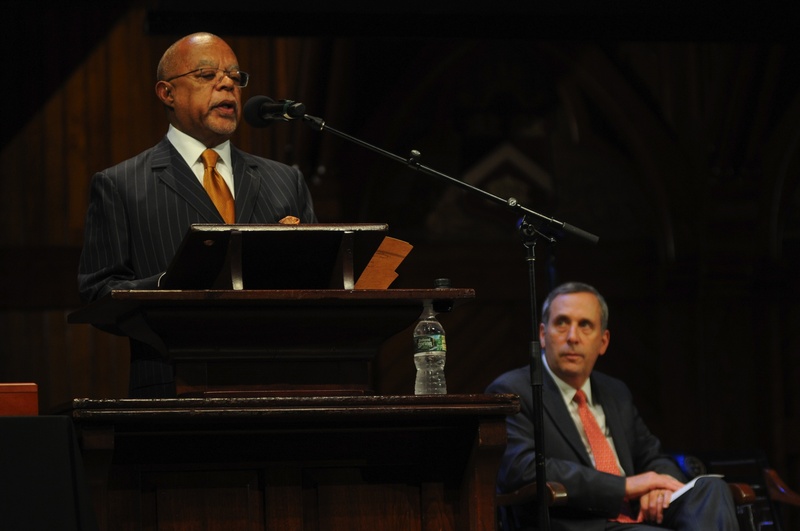 Henry Louis Gates Jr. delivers opening remarks at the W.E.B. Du Bois Medal Ceremony. In this moment he is praising University President Lawrence S. Bacow for his commitment to diversity early in his presidential term. Honoree Florence Ladd, an author and social critic, earned the most boisterous applause with a direct call to action at the conclusion of her brief but direct speech. In spite of a delayed flight that caused him to miss the first half of the ceremony, the rhythmic, up-tempo speech by social justice activist Bryan Stevenson — a man Desmond Tutu once called “America’s Nelson Mandela” — also captivated the crowd, with murmurs of affirmation echoing throughout the auditorium. “If you’re not sure about how you can make a difference, get close to the people who are incarcerated, or marginalized, or excluded, or abused, or neglected,” Stevenson said. Throughout the afternoon, moments of lightheartedness were juxtaposed with accounts of racial injustice in America. Glenn H. Hutchins ’77, the founder and philanthropist of the Hutchins Center, alternatingly joked with the basketball team and relayed a note from Obama about the ceremony. Chappelle offered occasional comedic relief with a surprised expression or a well-timed grin. Harvard has presented the medals annually since 2000 to individuals in recognition of their contributions to African American culture and the life of the mind. Businesswoman and philanthropist Pamela Joyner, Rensselaer Polytechnic Institute president Shirley Ann Jackson, and businessman and philanthropist Kenneth I. Chenault also received this year’s award. Past winners include Oprah Winfrey, Maya Angelou, Muhammad Ali, Steven Spielberg, and Chinua Achebe. Last year, honorees included rapper LL Cool J and filmmaker Ava DuVernay.